Back in the 1980’s there were a number of (then) “Computer Coordinators” in the state working away, largely by themselves. These were the years when Apple IIes were widely used along with a diverse collection of TRS-80s, Amigas, and Commodore 64s, with some folks on the cutting edge of graphics work with Commodore 128s! In 1985 and 1986, the Maine Department of Education produced statewide “Maine Computes” conferences with MDOE staff members Richard Riley and Dennis Kunces responsible for the details. The Auburn-based Center for Educational Services (often called “The Center”) assisted with planning. 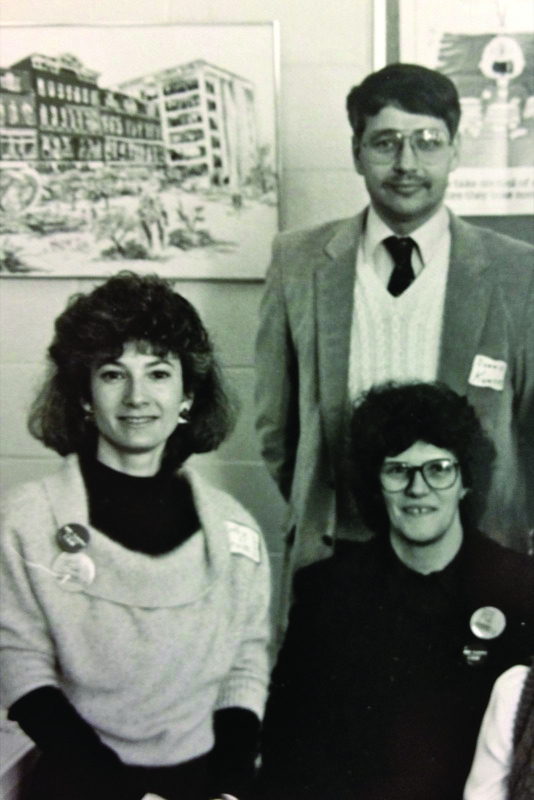 During these early years, the one organization that brought together a number of coordinators was the Maine Computer Consortium (MC2), a project directed by Doris Ray and Cathy Glaude from The Center. Membership in MC2 provided a number of benefits, not the least of which was access to the MECC collection of software, a library of which was available at The Center. Carl Ouellette (Caribou) also had a library of that software that was used by those in The County, and Betty Jordan had one in Washington County. Members could bring their own floppies and plan on spending a chunk of time making copies of the software. This provided many schools with their first legal software collections, as it was possible to provide a copy for any teacher upon request. MC2 also held several meetings each year, creating opportunities for early networking among coordinators. The roundtable discussions held at these meetings undoubtedly laid the foundation for the similar discussions held at present ACTEM meetings. “There was lots of commiseration during these discussions,” recalls Doris Ray. “I remember a story of one computer teacher-coordinator (in those days this was common) who told me that he was teaching a class in Pascal programming--and he was very hopeful for the next school year: HE was going to get a computer to use in his class!” MC2 ended in the early 1990’s with John Lunt (Freeport) as its last Director. It was during the late 1980s that a very active group of computer coordinators in York County started meeting. As former Director of MC2 and still with the Center, Lunt was invited to participate in those meetings and he recalls key figures in the York group included Bob Stackpole (Waterboro), Diane Wedgewood (Hiram), the late Tim Loughlin (Saco), Gary Seekins (Kennebunk), and Roni Emery (York). As word of the York meetings spread, there was increasing interest in participation by others in the general geographic area, and the York group grew beyond its county beginnings. This was the seed that would eventually grow into ACTEM. The first step in this process resulted in the decision to hold the expanded group’s meetings in Augusta. Dennis Kunces secured meeting space and the group’s membership expanded. To this day, Dennis continues his generous donation of time and effort in many different ways including overseeing our Professional Development Program since its inception in 1999. Increasingly it was recognized that the support that could be provided by a gathering of coordinators was incredibly helpful to each when they returned to their districts. As the group that had started in York County was evolving, it was not without some stress. One of the biggest issues was whether the group should be exclusively for computer coordinators or if it should be expanded to include others. The majority then attending meetings chose to have a broader membership, but that was not accomplished without disappointment for some who felt that the expansion distorted the idea that had originally brought coordinators together.